We can build almost any of our mattresses to custom sizes with dimensions of 28-76 inches wide and 50-84 inches long. These are great for unique beds such as antique bed frames, European bed sets, cribs, boats and motor homes. Please select the size you need from the blue menu above to see prices and place an online order, or call us with any questions you may have. We also now offer custom made percale sheets in any size! All of our custom "box springs" are actually zero-deflection wooden "foundations". Due to the complexity in making a steel foundation, it is not possible to offer these in custom sizes. Using wood allows us much greater flexibility in sizing both width, length and height. Modern headboards average height is 54 inches which works well with today's mattress sets that usually range from 23-29 inches in height. Many antique beds have lower headboard heights and sometimes today's tall mattress sets will cover most of the headboard and footboard, hiding the beauty of your antique bed frame. We offer optional custom made low profile boxes at no extra cost to help maximize the beauty and comfort of your bed set. 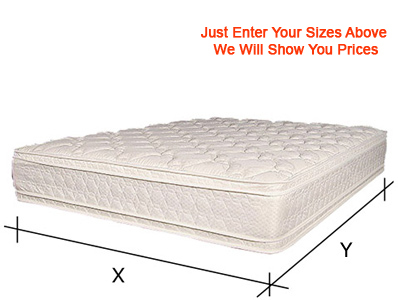 The height of each mattress is on the product pages so that you can consider set height in your purchase decision. Any size is available upon request but with many models you are limited to being smaller than a standard King or California King mattress. This is because the mattress will be made by taking the King and shortening it. With some innerspring models, multiple coil sets can be combined to exceed King size but that is not possible on all models. If you need an odd size bigger than a King, please call us to find out what models are available. At this time, we only distribute 4-sided rectangular mattresses. The size can be as large as a king, so up to 76" wide and up to 84" long. If you need an odd size bigger than a king, please call us to find out what models are available. You can also order a custom matress small enough to fit in a baby's crib. Mattresses are formed by rows of metal springs and since springs cannot work if cut in half, your mattress core will be sized in increments. A single row of springs can alter the size by up to 2 inches. This means that if you order 47x63 it will be built between 46x62 to 48x64, but most of the time it will come within 0.5 inches of the requested size. 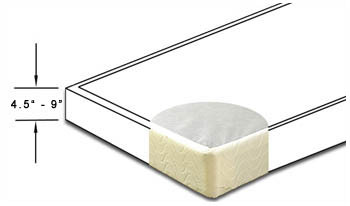 We recommend you order the mattress 1 inch smaller than the space it is meant to fill. This will allow for variations in spring size and also provide extra room for tucking in sheets and blankets. Please include instructions for size range tolerance in the comments section of our cart checkout procedure. We will never ship out a mattress that exceeds the size you have ordered without contacting you first to check if the size variance will cause an issue. Since these are custom made for you they can not be returned, so please be careful when taking measurements. On some bed sets, the box spring will be a different size than the mattress so you will need to measure both pieces. Also, since beds are often set up not perfectly square, you will need to measure all four sides of the bed to find the correct size. Be sure to check for boards or bolts that often protrude in to the mattress area and order your pieces small enough to fit inside of these protrusions. All of our mattresses have at least a 5 year warranty, some have up to 15 years. When a mattress has a "full" warranty, the mattress cost will be paid 100% for the entire life of the warranty. For partial "prorated" warranties, the mattress value is slowly reduced over the life of the warranty. Many of our mattresses have a hybrid warranty where they are full for the first year and prorated for the rest. However, the warranty only covers the cost of the replacement mattress, so you will be responsible for shipping costs, or you may pick the mattress up directly from the factory warehouse. When will I receive my new mattress? Custom mattresses take 1-2 weeks to produce, and then 1-10 days to ship. Expedited shipping is available in some areas, but will usually cost more money and usually only shortens the entire production delivery cycle by a few days, so please place your order soon enough to avoid conflicts If you do have a tight deadline, please call us before placing your order so we can determine a more accurate estimate for you.